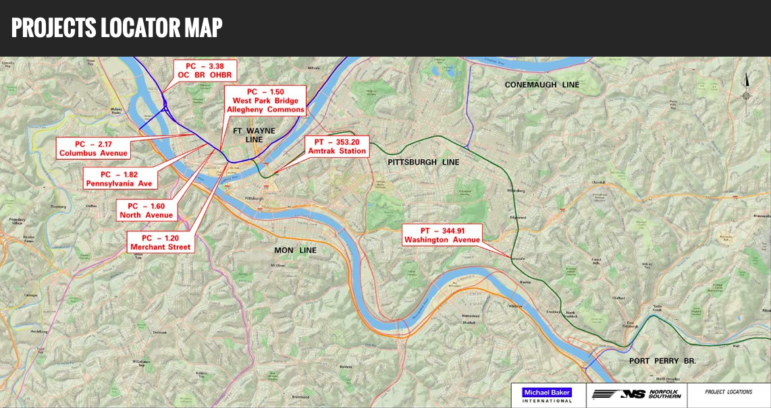 Updated 2/21/19: The City of Pittsburgh said Thursday that it is asking Norfolk Southern to submit alternate plans to the company’s proposed train route. The city’s director of mobility and infrastructure criticized the railroad for being unresponsive to city requests, according to a Feb. 19 letter to the Public Utility Commission. The city also said today that it filed a related protest with the PUC two weeks ago. Before publication of this story, a city spokesperson told PublicSource that city officials would not be commenting. 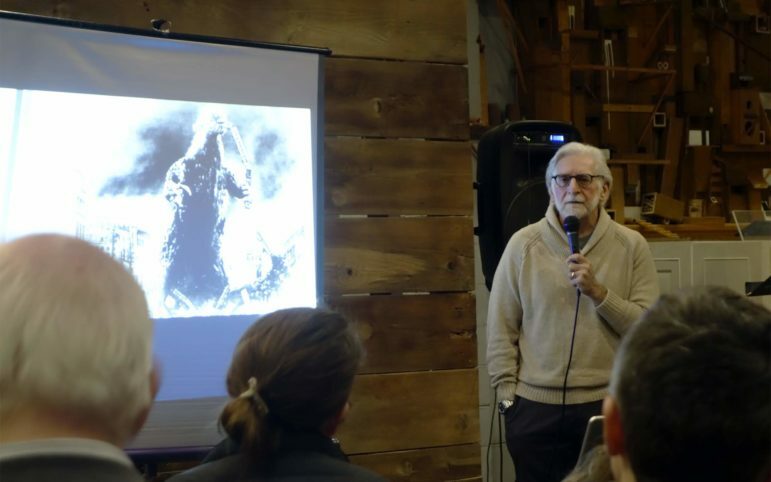 Glenn Olcerst spent more than an hour explaining the dangers of increasing train traffic through Pittsburgh to about 50 residents in the Allegheny West neighborhood on a Monday evening in February. Then he projected a slide of Godzilla with a train dangling between his teeth. "Let the government and the railroad know they shouldn’t underestimate the power of what a community can do when we stand together,” Olcerst said. Olcerst is a North Side resident who, along with his wife, Barbara Talerico, is leading the fight against a $29 million proposal by Norfolk Southern Corporation to redirect double-stack train traffic from its congested line south of the Monongahela River, and instead run them from the North Side through the center of Pittsburgh’s East End. On Monday, a group founded by Olcerst and Talerico called Rail Pollution Protection Pittsburgh [RP3], urged the state Public Utility Commission [PUC] to investigate whether Norfolk Southern is properly inspecting infrastructure, such as bridges, or “ignoring the results.” Sen. Wayne Fontana, D-Allegheny, has also asked PUC to look into the matter. The Pennsylvania Department of Transportation [PennDOT] awarded Norfolk Southern a $20 million grant in April 2018 to help fund its proposal. The RP3 group is now asking that spending be frozen so the state can look into the validity of the company’s inspections. Fontana previously asked for a funding freeze and, in a Feb. 11 letter to the PUC, wrote that he had heard that the commission could halt rail traffic due to safety risks or violations and wanted clarification. The PUC is reviewing Fontana’s letter. RP3 claims that a sinkhole was found near one of the bridges on the route. Norfolk Southern disputes that the hole is a sinkhole and said it has been repaired and deemed safe by inspectors. Trains already run on Norfolk Southern’s proposed route, but nine bridges along the way — six on North Side — are too low for trains carrying double-stacked cargo containers to pass under. If the proposal goes through, the bridges would be raised and train traffic would substantially increase through 24 Pittsburgh neighborhoods and nearby municipalities. 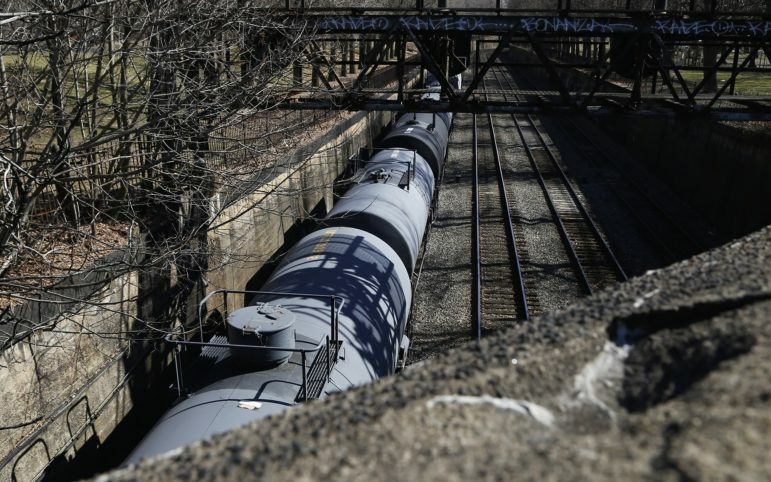 Olcerst told the Allegheny West crowd that he believes stacked trains will increase the risk residents face of “a 1 or 2-mile-long train carrying 2 to 4 million gallons of oil igniting” and exploding, he said. And if the train is carrying chlorine, his presentation showed a poisonous cloud shaped like a coffin that could cover Pittsburgh in minutes. “It’s not like wind is going to topple them over,” she said. Norfolk Southern touts its safety record as among the best in the industry, with only around two derailments per million miles traveled the past five years. The new route will save the railroad hours of travel time and give it increased capacity for double-stack trains. The company says the noise impact will be minimal and the overall impact of pollution in the region will be lessened because trains will actually be traveling on a shorter route. An analysis by local academics calls into question the company’s pollution claims. Train experts note that railroads can ship goods long distances at lower cost and with less overall environmental impact than trucks. For residents like Paul Beer, a software engineer at PNC Bank, Olcerst was preaching to the choir. Before seeing the presentation, Beer already knew about the pollution, the increased noise, the potential for old trees in the park to be cut down and for added danger because raised bridges could make it more difficult for passing cars and bicycles to see each other over the increased bridge incline. Henry Posner III is chairman of the Railroad Development Corp. and an adjunct professor at Carnegie Mellon University who teaches a course on railroads. He said he thinks more trains in Pittsburgh can be good. Local residents are not taking enough of a big-picture view of the issue, he said. Every day, Posner passes large semi-trucks that snarl traffic and spew pollution on highways and neighborhood streets. An often referenced study by the Federal Railroad Administration showed that trucks are four times less fuel efficient as locomotives on a pound-for-pound basis. Environmental advocates however are wary that cargo such as oil, gas and fracking sand might be efficiently transported but damaging overall. Matthew Mehalik, the executive director of the Breathe Project*, said he agrees that trains are cleaner than trucks. But with the caveat that pollution from trains in more populated areas impacts more people. "So even though the overall amount of pollution might be lower, it concentrates it in a more narrow region in their neighborhoods,” Mehalik said. The new train route could be as much as three hours faster than the current train route, according to a 2015 report from PennDOT. Some goods that are now being carried by trucks could be moved on trains instead, Posner said. The railroad plans to complete its environmental impact study on the proposed route later this year, and it is up to companies shipping goods to decide if they will use trains or trucks. But while the reduction in truck traffic is theoretical, the increased environmental impact from more trains is not. The Center for Healthy Environments and Communities at the University of Pittsburgh examined population data from the U.S. Census and found that more than 88,000 additional people live near the proposed new path through the city as compared to the route it would be pulling some traffic from. About 70 percent of those people live in communities designated by the state as Environmental Justice Areas, which include portions of Manchester and the Borough of Wilkinsburg. Under the definition, these areas have substantial populations of low-income or minority residents. Some communities could benefit from the change. If the train traffic shifted away from the rail line south of the Monongahela, about 40,000 people would be exposed to less pollution than they are now — about 50 percent of those people live in Environmental Justice communities. 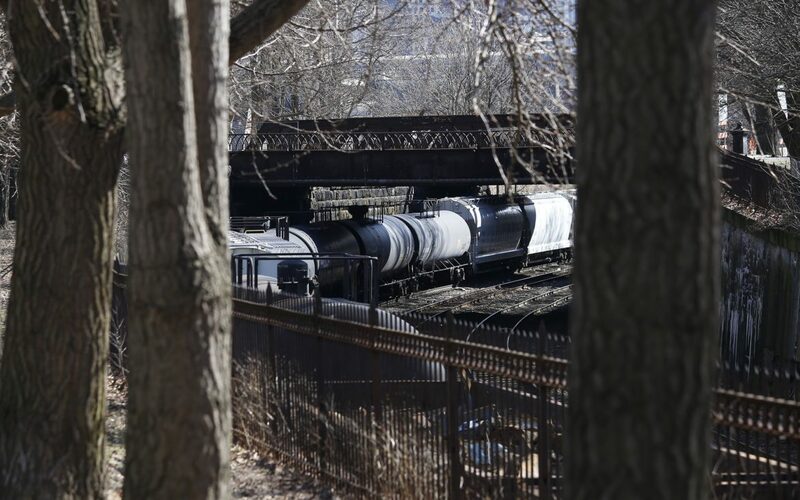 A group of academics at Carnegie Mellon has studied the harms of extra rail pollution. Their research found that for every additional 10 trains that pass through Allegheny County, an additional six people would die from causes related to air pollution. The study says these continuous impacts, which disproportionately impact children and the elderly, are more harmful than rail derailments. “As a result, it seems fair to ask why some of the region’s most disadvantaged communities — that already suffer from unacceptably high levels of air pollution — should bear the cost of increased shipments that will yield them no direct benefit,” the study’s authors wrote in a July op-ed in the Pittsburgh Post-Gazette. Norfolk Southern estimates there would be more than 20 additional trains per day along the new route and that number could rise if demand increases, according to an email from Jonathan Glass, a spokesperson for Norfolk Southern. The company could run as many as 50 additional trains per day in the future. But because the new route is shorter, the company said pollution should decrease overall in the region. Mehalik said he worries the trains will start to carry additional oil, gas and petrochemical products from the fracking boom in the region. But Posner said Pittsburghers, like other consumers, would also benefit because cheaper transportation costs translate to cheaper goods. "The ultimate winners are the railway customers who would otherwise ship by truck or have their goods in a less efficient way,” he said. Federal laws prevent municipalities from passing laws more stringent than federal rules. This prevents Pittsburgh and other localities from creating special rules that would impede railroads and potentially increase shipping costs. State law regulates bridge height. Mehalik said he thinks the company should share some of its increased profits with the local communities directly. “If they want to increase profits, that can’t come at the expense of people’s health and they need to do the necessary investments to protect people,” he said. Olcerst retired in January 2018 after 30 years fighting companies as a labor lawyer. Originally, he got involved in the train issue because he wanted to protect some of the old trees in the Allegheny Commons Park near his home. But after a public meeting hosted by Norfolk Southern in June 2018, he started meeting with local and state politicians in July, trying to gain their support. He built up his email list to more than 500 people. And then on Aug. 5, a double-stacked Norfolk Southern train derailed on the South Side, the same kind of train the company wants to run from the North Side through the East End. No one was harmed in the accident and the cause, reportedly a broken rail line, is still being investigated. Olcerst emailed his list, and residents became more concerned about the risks of derailment in their neighborhoods. There isn’t any data that suggests double-stack trains derail more frequently, according to the Federal Railroad Administration. And on Jan. 31, the safety officer for the Port Authority of Allegheny County requested that Norfolk Southern provide additional information about its safety precautions to prevent a future accident along its busiest bus routes. The Port Authority has not yet received a response. Talerico, Olcerst’s wife and partner in fighting the rail project, decided that they needed to install cameras and air monitors along the train tracks, to verify the number and kinds of trains that Norfolk Southern says are currently on its tracks. And to do that, they needed to start talking to community groups, to find volunteers who would put up cameras on their property. Keating of Manchester said she thinks many North Siders are coming up with whatever arguments they can to protect the aesthetic value of the Allegheny Commons, a historic park on the North Side that they consider their front yard and to protect their already high property values. Olcerst said that a representative from Norfolk Southern recently met him at his home and indicated he thought the company could get behind a proposal to provide maintenance funds for the Allegheny Commons. Glass wrote in an email on behalf of Norfolk Southern that he did not have any information about a potential maintenance fund. Keating, who lives right next to the train tracks in Manchester, said the focus should be on how to mitigate the pollution for communities like hers that suffer disproportionately from pollution. Manchester has some of the thinnest tree cover in the city, Keating said, so it would make sense to push the company to add trees along the proposed route, to improve air quality, decrease the noise and cool the neighborhood in the summer. Olcerst and Talerico said they plan to continue taking their presentation to more communities. 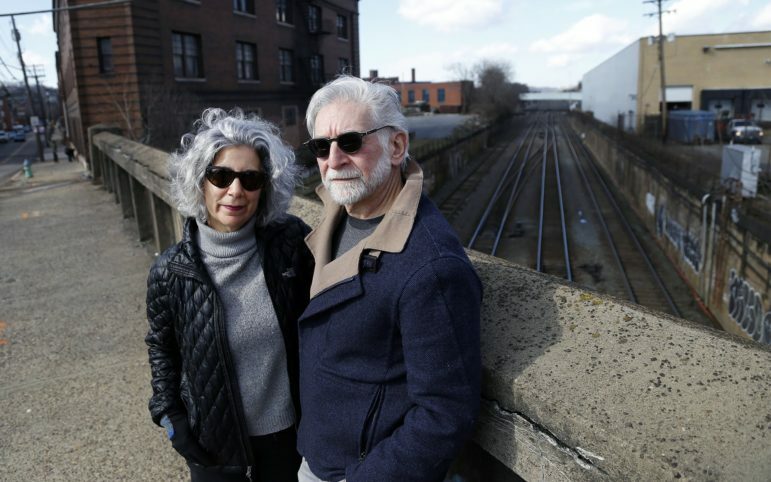 Leaders in communities like Regent Square and Wilkinsburg — both along the proposed route — told the couple they didn’t know about the rail project before hearing Olcerst and Talerico’s presentation. They plan to present in Swissvale Feb. 25. “I shouldn’t have to take my retirement life to do this,” Olcerst said. Timothy McNulty, a spokesperson for Pittsburgh Mayor Bill Peduto, wrote in an email that the city would not comment on the matter. There are still a lot of unknowns on the project. The environmental assessment, which will include a noise analysis, won’t be released until the summer. Additional study may also be required on the impact on Allegheny Commons due to its status as a historic landmark. Norfolk Southern hasn’t held another public meeting since the first one it held in June 2018, though the company said it will later this year. But despite opposition from some residents, the project appears to be going forward. About $398,000 of the $20 million in PennDOT funding has been paid, according to a Feb. 11 email from department. Norfolk Southern’s Glass wrote that it’s too early to discuss starting construction before PennDOT’s review of the project is complete. About 20 people, including city officials, representatives from local utilities and officials from Norfolk Southern, showed up to an on-site meeting held by the the Pennsylvania Utilities Commission for the proposed rail project on Feb. 7. But the train noise in the park was so loud during the meeting that nobody could hear what was being said, Olcerst said, so they considered moving it to another location. The railroad said the noise from the wheels of the loaded coal train only lasted a couple of minutes. Olcerst said a Norfolk Southern representative said the noise was overpowering the conversation. “You can’t use the park because you can’t hear yourself talk," Olcerst said. *The Breathe Project receives funding from The Heinz Endowments, which also provides funding to PublicSource. Correction (2/20/2019): This story previously misstated the level of funding paid by PennDOT.